Ultrasonic Rhinosculpture – The Latest Advancement In Rhinoplasty Surgery. Mr Chana is now offering ultrasonic rhinoplasty which is a refined technique of improving the results and recovery from nasal reshaping procedures. He is one of the first surgeons in the UK to offer this technique and already has numerous patients who have benefitted from this technique. Ultrasonic rhinoplasty is the latest advance in rhinoplasty surgery which utilises ultrasonic energy to reshape the bone. Altering the shape, profile and width of the nasal bones is one of the key steps involved in producing good results from rhinoplasty. In fact, the majority of nose reshaping procedures involve reducing the size of the bony hump and also narrowing the width of the bone in order to make the nose smaller and more streamlined in appearance. Current techniques are quite traumatic since abrasive instruments such as rasps and osteotomes are used to file down and chisel the bone. These techniques have a risk of leaving fine irregularities on the bone and also cause quite considerable tissue trauma both to the bone and to the surrounding soft tissues. As a result there is considerable swelling and bruising which prolongs the healing time. 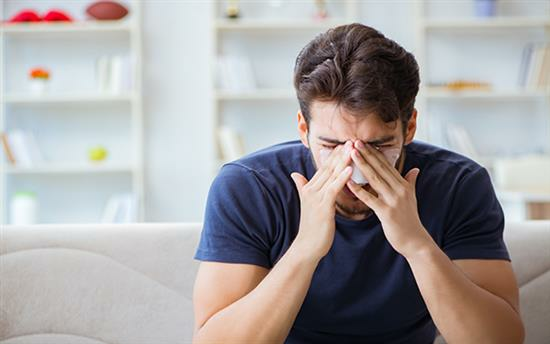 There are also greater risks of the bone and tissues healing irregularly in the months after the rhinoplasty which often results in the accepted risk of having to undertake revisional surgery in a proportion of cases. The procedure for the rhinoplasty is the same as planned and will involve opening the skin to create access to the underlying bone and cartilage. Any modifications to the cartilage elements are carried out in the usual manner but the bone is reshaped using ultrasonic energy. The machine used for ultrasonic rhinoplasty is called a piezotome. 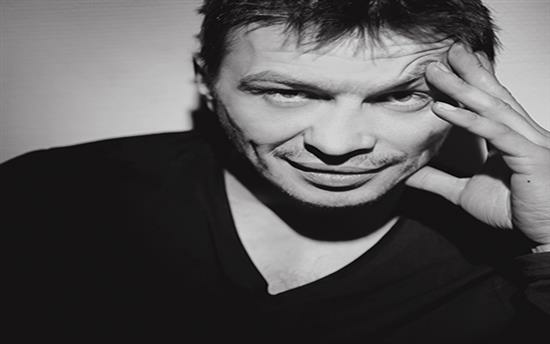 This technology is extremely accurate and allows the experienced surgeon to selectively sculpt the nasal bones with the utmost control, allowing for a superior and more precise technique. The technology uses an ultrasonic tip and water rather than conventional coarse instruments such as rasps and chisels. There is no damage which occurs to the cartilage, soft tissue and delicate mucosal lining of the nose and as a result, there is reduced swelling and bruising resulting in more rapid healing times.The ultrasonic energy is so specific that if applied to any soft tissues such as skin and cartilage the tissues do not absorb the energy and these tissues remain completely undamaged. Only bone can absorb the energy and depending on the degree of energy applied through a probe the bone can be extremely precisely sculpted or even cut if needed at higher energies without any collateral damage to surrounding tissues. This technique is much safer, less traumatic, causes little to no bleeding, and greatly accelerates healing times. Although the technology has been used by a handful of eminent rhinoplasty surgeons in Europe Mr Chana is the first surgeon regularly utilising this technique in the United Kingdom. The device used for rhinoplasty is shown to the left. The handpiece which delivers the ultrasonic energy to reshape the bone is shown on the right. This handpiece can be fitted with a myriad of different types of tips which come in various shapes and sizes according to the particular type of function or purpose required during the rhinoplasty. 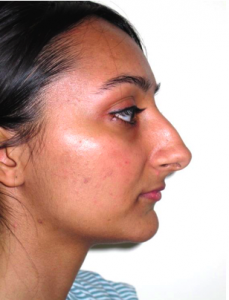 This lady demonstrates typical features of a large nose with a significant bony hump which she requested to be reduced in size. Using normal techniques this degree of bone reduction would require extensive rasping or reduction with an osteotome (chisel) which are relatively crude instruments. In this case the ultrasonic technique of bone reduction was used with minimal bruising as can be seen in the one-week post-surgical photo below as the cast has been removed. One-week post-operative appearance after removal of the cast demonstrating minimal bruising. 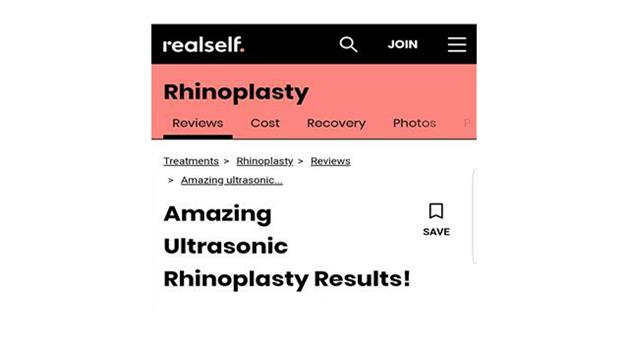 What is the recovery after ultrasonic rhinosculpture? In terms of recovery the main advantage of this technique is less bruising and enhanced recovery times. 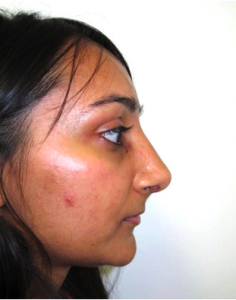 Individuals will vary in terms of the extent of bruising that can occur following rhinoplasty and this can also vary according to the extent of surgery which is required. In general bruising tends to last approximately 2 weeks with rhinoplasty surgery but with this technique the degree of bruising is reduced. Other factors involved with the rhinoplasty recovery are similar to standard techniques. You will still need to wear a cast or splint for approximately one week after surgery and incisions also need to heal. It is important to realise that with any surgery it can take over 6 to 9 months or longer to fully appreciate the final results. What types of noses can be improved with ultrasonic rhinosculpture? Almost any type of reduction rhinoplasty can be suitable for this technique. 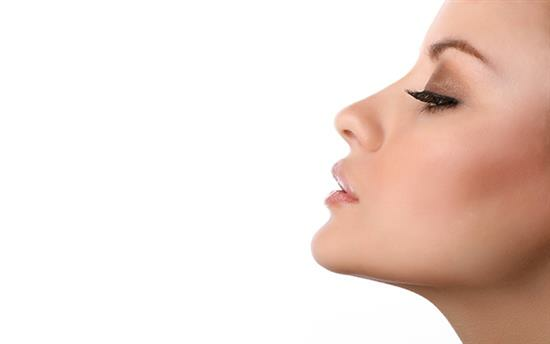 Most forms of nose reshaping which involves reducing a dorsal hump or narrowing the width of the nasal bridge is suitable. It is also useful for correcting deviated noses where there is a significant bony deviation. The technique does not help other structures such as the soft tissues include the septum and other nasal cartilage s which often need to be adjusted to improve nasal shape. 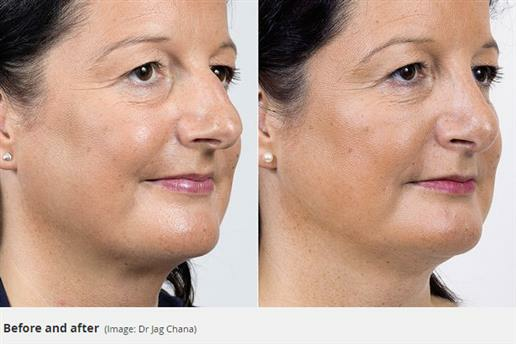 These manoeuvres can easily be undertaken in the usual manner in combination with the ultrasonic bone reshaping.